DISCLAIMER: What I have posted here is my personal experience/suggestion and research on flaxseeds. And for educational purposes ONLY. NOT a cure. ALWAYS consult WITH YOUR physician when dealing with a medical condition. Flaxseeds are so rich in nutrients, omega-3 fatty acids and they contain high amounts of plant compounds called lignans. Lignans are converted by the digestive system into enterolactone and enterodiol. These compounds have been found to protect women from breast cancer by blocking the effects of estrogen and making it less available to your cells (there are “unfriendly” estrogen produced in women’s bodies that can lead to a high risk of estrogen-related cancers). The health benefits of flaxseed range from cardiovascular, antioxidant and anti-inflammatory, cancer prevention, to name a few. See the link below for further information on the use and nutritional benefits of flaxseed. I’ve been drinking flaxseed tea for over 2 years now. 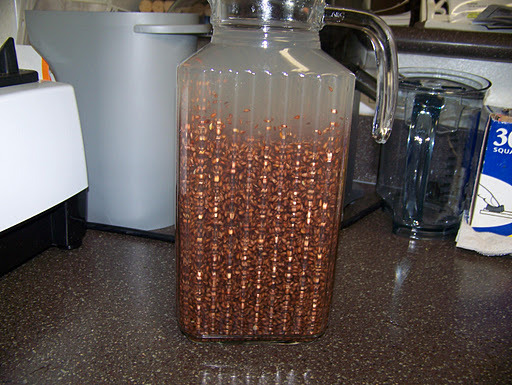 I usually boil 4 cups of reverse osmosis water into my pitcher filled with 4 tbsp of organic whole flaxseeds (NOT flax meal). Let it sit to cool off then I place it in the refrigerator to store. I would do this in the evening before bedtime; then I would have it available and drink it throughout the following day. I’ve made this a practice since the beginning of 2011. It was difficult in the beginning because it was “another thing” I had to add on my LONG list of “things to do” for my treatment. I wish I can find this drink at a local Starbucks or Peet’s Coffee shop. It would make my life a whole lot easier as it would be one less thing for me to do. But, this “another thing” for me to do has actually become like second nature as I’ve been doing it for awhile now. Making tea out flaxseeds is just one way to use this superfood. You can also grind the flaxseeds and add to your smoothies, sprinkle it in your cereal, add it to your muffin mix, the list can go on and on! I’ve even learned to use it as egg substitute! You can purchase whole organic flaxseeds or ground flaxseeds at Costco, Whole Foods, Trader Joe’s or any natural health food stores in your area. Here in Hawaii, I get whole organic flaxseeds at Down To Earth,Whole Foods or Celestial. They usually come in packaged form or bulk. When you buy it in bulk, make sure the container is securely covered and the store has a good product turnover to ensure maximal freshness. Amazon.com is also a great place to check out on-line especially with their super-saver deal (FREE shipping over $25 purchase). Here’s the recipe I’ve been following from Dr. Steelsmith of Steelsmith’s Natural Health Center. Pour the water into the cup of flaxseeds. Let it sit and cool. Then store in the refrigerator and drink when desired. 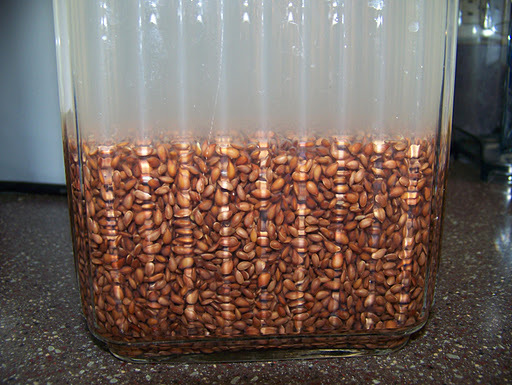 The whole flaxseeds will soften as it soaks. When you drink it, you can eat the seeds as well. So enjoy as you “drink and eat” your flaxseed tea! I’ve recently noticed Whole Foods has vendors selling flaxseed drinks! So, YAY! I’m just happy as when I am not able to make it at home, it’s available for me to pick up when I’m on the go. And they also have vendors selling chia seed drinks, etc.! Another great superfood drink! I will blog about it soon. I know this flaxseed tea works as it has really reduced inflammation in my system! I can feel it!